The Le Nain brothers––Antoine, Louis, and Mathieu––were born in Laon and settled in the artist’s community of Saint-Germain-des-Prés, in Paris, by 1629. The brothers were founding members of the Royal Academy of Painting and Sculpture in 1648. Antoine and Louis died that same year, presumably of the plague. The Le Nain studio produced portraits and religious works as well as mythological and genre scenes. 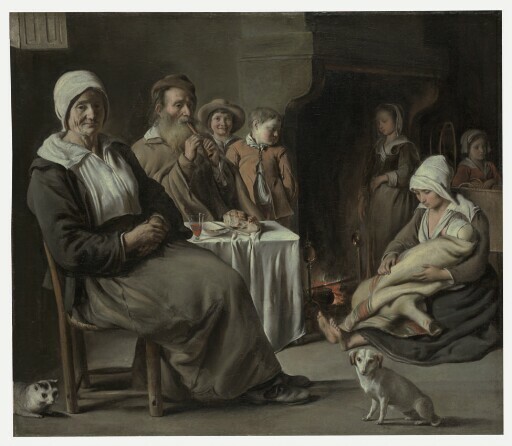 A group of peasant scenes characterized by their sensitive, subdued palette and emotional solemnity has traditionally been assigned to Louis, who has been regarded as the genius of the family. In the Peasant Interior with an Old Flute Player, an air of serenity surrounds the dignified group, still and silent but for the sound of the flute. Despite the artist’s clear sympathy with humble values, however, the scene is an idealized portrayal of peasant life. Wine in a crystal glass was not peasant fare. Together with the bread placed on the white tablecloth, the wine evidently alludes to the Eucharistic meal and Christian charity, exemplified by this humble household. Much remains to be learned about the Le Nains’ patrons, who may have included members of pious religious groups in Paris and the outlying regions. The reforming clergy encouraged the devout to emulate the virtues of the idealized poor, such as simplicity, humility, and patience. purchased through (E. V. Thaw & Co., Inc., New York) by Kimbell Art Foundation, Fort Worth, 1984.